Small dogs are often thought of as compact pets with compact needs, but this is not the case when it comes to nutrition. When choosing the best dog food for small dogs, you have to keep in mind some of the different physiological needs they have. These include jaw size, energy levels, bone structure, digestive systems, and skin and coat health. Because of these differences you want to make sure your pet gets only optimal nutrition. You also want to make sure they receive it in a way that is most effectively digested and processed by their tiny bodies. So, have you thought much about what goes into choosing the right food for your small dog? If not, then now is the time to step back to learn more about size-based nutrition and to help find the best dog food for your small dog. Generally a small dog is considered to include anything less than 22 lbs ,or shorter than 16 inches. Many small dog breeds are known for being cute and cuddly, but you have to remember these are large souls in small bodies. Originally these smaller breeds were prized for their hunting skills. Today, the smaller breeds are usually just great companions. They are often known for being intelligent, high energy, sometimes stubborn, and one of the best friends you could have. Though small in size, these breeds are often tough and can live as long as 16 to 20 years if properly cared for. From house pet to badger hunter, these smaller dog breeds have a lot to offer and you should be sure to return the favor. Though some small dog breeds are referred to as toys, they should all be treated like real dogs. They not only require proper exercise and interaction, but also optimal nutrition to meet their unique needs. They need the best dog food for small dogs. These smaller dog breeds also have varied needs during their different life stages. As puppies, smaller breeds grow rapidly and need higher calories to accommodate this growth. Adult dogs who are considered small breeds tend to want to graze throughout the day, eating according to their changes in energy levels. However, this does not mean you should keep their food bowl filled to the brim. Instead you should ration their portion sizes using the manufacturer’s guidelines as a starting point. Lastly, senior dogs of smaller breeds are often known to slow down and become obese. During this phase of their life you may have to cut down on calories and focus their diet on weight management. You will also want nutrition to help support their hips and joints as they get older. As you can see, finding the best dog food for small dogs might take a little extra work. Pound for pound, most smaller dog breeds need more energy than larger breeds. As such they require differing calorie intake for their faster metabolism, as well as a smaller sized kibble. Smaller dog breeds tend to have longer life spans and higher energy levels, but they also have smaller stomachs. As such, they may need to be fed smaller portions a few times a day to provide optimal nutrition and keep their energy levels up. Small dogs are also more susceptible to certain diseases. Some more common health issues associated with smaller breeds include obesity, dental disease, and adverse skin and coat conditions. Obviously you want to avoid all these things as best you can, and finding the right small breed dog food can help. You want to make sure your pet food has premium ingredients that address these particular needs. This recipe contains nutrient-rich whole foods to help support active little lifestyles and longer life spans of smaller breeds. While on this diet, your dog will have guaranteed levels of L-Carnitine to help utilize fat and maintain an ideal weight. It also includes glucosamine and chondroitin to support their hips and joints. The whole grains are a great energy source. The Omega 3 and 6 fatty acids will keep your pet looking great. Top listed ingredients include deboned turkey, chicken meal, salmon meal, oatmeal, ground brown rice, ground barley, and rye flour. Customers who love Wellness Dry Dog Food say it is a great dog food for small dogs, some even call it a miracle. Super-finicky dogs love it, their coats shine while on this diet, and it has quickly become the dog food of choice for many owners of small breeds. This may be a small kibble for small mouths, but it is packed full of big, balanced nutrition. With 27 percent protein and 16 percent fat your small breed dog can maintain an active and healthy lifestyle. It has naturally good flavor your pet will love, while also providing all the necessary vitamins and minerals. The Diamond Naturals brand is manufactured by a family-owned company out of the U.S. They make sure all their products come from primarily natural ingredients with minimal processing. Top listed ingredients include chicken, chicken meal, cracked pearled barley, ground rice, egg product, and chicken fat. There is no wheat, no corn, and no soy in this dog food. 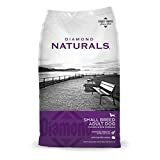 Customers who purchased Diamond Naturals say it is a quality choice for dog lovers. It is the best dog food for small dogs at the best possible price. It comes highly recommended. Hill’s Science Diet is a brand you have probably heard of. It is known for breed specific foods designed to meet the unique nutritional needs for dogs of all breeds, ages and sizes. This adult small and toy breed dog food is precisely balanced to provide the best possible nutrition, tailored to match the needs of smaller dogs. The calcium and high-quality proteins support bone and muscle strength. The Omega 6 fatty acids help improve dry skin and a dull coat. Vitamins C and E boost immunity and help your pet live a longer, healthier life. It also has controlled levels of sodium and phosphorous to maintain a healthy heart and kidneys. Top listed ingredients include whole grain corn, chicken by-product meal, pork fat, brewers rice, soybean mill run, and flaxseed. 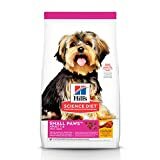 Customers who buy this product say even the pickiest eaters love the smaller bite sized kibble of Hill’s Science. It is often recommended by veterinarians and a product many pet owners are happy to invest in as well. If your small dog wants big ingredients, then you need to take a closer look at Halo. This brand features real proteins and other ingredients you can easily recognize. There is no room for artificial colors, flavors, or preservatives. Instead, this dog food for small dogs is natural and holistic. There is butcher quality fowl, whole egg, and farm-raised vegetables. The smaller kibble is not only wholesome, but easily digestible with natural sources of soluble and insoluble fiber. The top listed ingredients include turkey, eggs, pearled barley, oats, turkey liver, whole peas, and pea protein. Other recognizable ingredients include flax seed, quail, pheasant, sweet potatoes, apples, blueberries, and green beans. 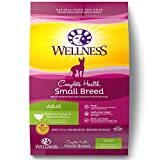 Customers say this is the best dog food for small dogs because of the easily recognized ingredients. It reflects a more natural diet and their canine friends thrive on this well-balanced diet. This dog food for small dogs is specially formulated to meet the needs of small breeds. Made with only the finest ingredients, this food is wholesome and packed full of nutrition. It also features BLUE Life Protection Formula, with increased protein and carbohydrates to meet higher energy levels. The kibble is delicious and highly digestible, so all the nutrients are properly absorbed. Not only does this dog food contain a top quality protein as the leading ingredient, it is also full of hearty and nutritious fruit and vegetables. The top listed ingredients include deboned chicken, chicken meal, whole ground barley, whole ground brown rice, oatmeal, chicken fat, and tomato pomace. Customers who like Blue Buffalo say the pieces are tiny and very tasty. Their dogs seem to love the flavor of these all natural ingredients. They also say it is great for dogs with stomach sensitivity or allergies. 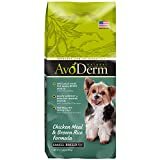 If anyone is looking to change the diet for small dogs, then this food comes highly recommended. Your small dog deserves high quality ingredients in a well balanced diet. That is precisely what you get with AvoDerm. The formulated levels of protein, fat, and other nutrients are specifically measured for smaller breeds. These optimal levels help support the immune system, build strong muscle and bone, and even support healthy brain and eye development. Lastly, it is enriched with avocado oil to keep the skin and coat healthy from the inside out. The top listed ingredients include chicken meal, ground whole brown rice, ground whole white rice, oatmeal, chicken fat, and beet pulp. Customers love AvoDerm. They love the re-sealable bag to pack in and preserve freshness. Once they made the switch to AvoDerm, pet owners and dogs will not settle for anything less. Everything about the Nutrience brand is made with a purpose. Their products come from only quality North American ingredients backed bay their “no bad anything,” promise. They use small batch production to ensure control and unwavering attention to quality. This means your small dog gets natural, wholesome nutrition in every bite. The first ingredient in this dog food is a high quality protein for strong, lean muscle maintenance. Next come key antioxidants to support a healthy immune system. The last of the nutrients include Omega 3 and 6 fatty acids for good skin and coat. The top listed ingredients include chicken meal, brown rice, green peas, oatmeal, chicken fat, and dried beet pulp. Customers say this dog food for small breeds is perfect for their little canines. They originally bought it based on the list of wholesome ingredients and were impressed with the results. 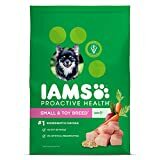 Iams is a reliable dog food brand that produces a wide range of products for all ages, sizes, and breed of dog. As such, their dog food for small dogs is a great product. Iams works to emphasize nutrition and meet the unique health needs of especially small breeds. For example, this dog food contains concentrated nutrition in smaller kibble and portion sizes. By focusing on a healthy inside, the difference will begin to show on the outside. This food has seven essential nutrients that will keep your dog’s heart healthy. On this diet your pet’s coat will be sleeker. They will also be more active and maintain an ideal body weight. The top listed ingredients include chicken, chicken by-product meal, corn meal, ground whole grain sorghum, and chicken fat. Customers who buy Iams say it is an amazing product their pets love. The smaller kibble is great for little mouths and now they will not feed their pets anything else. This is one of the best dog foods for small dogs because the key to overall health for your pet is through the stomach. As such you want a dog food made with primarily natural ingredients and minimal processing. The ingredients in this brand are extracted directly from plants or animal products, not synthetically produced. The dog food is also designed not only for small and mini breeds, but also pets with food allergies or sensitivities. This diet is formulated with active probiotics, healthy fiber, and digestive enzymes. This means it is easy for your pet to digest and supports the absorption and utilization of vital nutrients. Top listed ingredients include anchovy and sardine meal, ground brown rice, ground white rice, chicken fat, chicken meal, and pork meal. Customers who buy Holistic Select say it is a firm favorite for their pets and a great product they have come to rely on. This is another specially prepared, holistic brand considered to be the best dog food for small dogs. All the ingredients combine to provide balanced nutrition for your dog’s higher metabolism. Though the kibble size is small, this food has big taste as well as complete nutrition. The top quality protein sources combine to provide your pet with optimal nutrition for an active lifestyle and healthy muscle development. Top listed ingredients include duck, chicken meal, chicken, oatmeal, pearled barley, brown rice, dried tomato pomace, and chicken fat. Customers who buy Fromm Gold say it comes recommended by breeders and quickly became a brand they could trust. They also say they are impressed with the quality ingredients. The kibble is the perfect size and texture for their smaller dogs and they will continue to purchase this dog food as long as their pets shall live. What Makes the Best Dog Food for Small Dogs? For small dogs you not only need smaller kibble size, but the food has to be packed full of nutrition with smaller portion sizes. Each piece of kibble needs to contain high-quality ingredients to meet the essential nutrients required by your small breed. As with most dog foods, you want to make sure the leading ingredient is always a quality protein. This not only gives your dog a solid energy source, but also helps them build and maintain strong muscles. Another sustainable source of energy comes in complex carbohydrates like whole grains. This will help keep your dog’s energy levels up. Other key ingredients should include antioxidants for a healthy immune system, natural sources of Omega 3 and 6 fatty acids for healthy skin and coat, and glucosamine and chondroitin for joint and hip support. These are just a few of the things to look for in the best dog food for small dogs. Though there are plenty of things to look for in the best dog food for small dogs, the ultimate decision is up to you. As a proud pet owner you will need to find a dog food that is best suited to the unique needs of your pet. Whether your small dog is cute and cuddly, or a hunter at heart, there is a dog food for small breeds that will not only be tasty, but healthy. Just make sure the brand you choose uses top quality ingredients. Then you will have a happy dog both inside and out.